Cirmtuzumab is a novel monoclonal antibody developed at UC San Diego, with support from the California Institute for Regenerative Medicine (CIRM) and the CIRM-funded Alpha Clinic at UC San Diego. 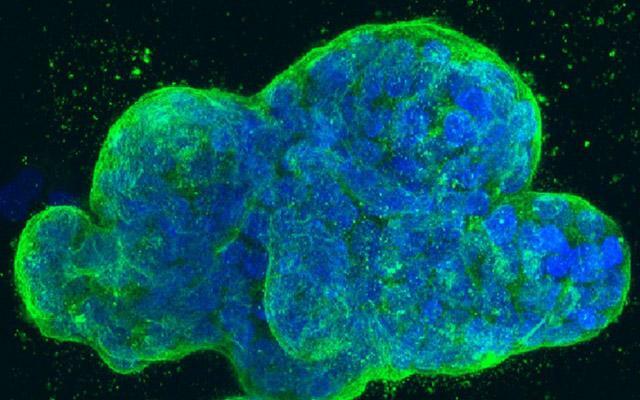 It targets ROR1, a cell surface protein that is present on tumors, but not in normal adult tissues, making it "a vital opportunity for targeting cancer stem cells" said Catriona Jamieson, MD, PhD, Alpha Clinic director who also directs stem cell research at UC San Diego Moores Cancer Center. Originally developed by Thomas Kipps, MD, PhD, Distinguished Professor of Medicine and deputy director of research at Moores Cancer Center, and colleagues as a potential treatment for chronic lymphocytic leukemia (CLL), cirmtuzumab is currently being considered and tested for other cancers as well. Breast cancer (in women and men) is the most common type of malignancy, with almost 270,000 new cases diagnosed annually, and an estimated 41,000 deaths each year. CLL is the most common form of blood cancer in adults, accounting for roughly one quarter of new cases of leukemia (21,000) and roughly 4,500 deaths each year. The phase I trial in breast cancer will recruit up to 15 eligible participants who will undergo combination therapy for six months. Cirmtuzumab will be combined with paclitaxel (brand name: Taxol), a chemotherapy medication originally derived from the Pacific yew tree and effective in treating a several types of cancer. "Although ibrutinib is standard of care for patients with CLL or MCL, it is exceptionally rare for the drug by itself to completely eradicate all leukemia cells or produce long-lasting remissions in CLL without continuous therapy," said Kipps, who began investigating ROR1 as a cancer target in 2004. "As a result, patients typically need to take ibrutinib indefinitely, or until they develop intolerance or resistance to this drug. Cirmtuzumab targets leukemia and cancer stem cells, which are like the seeds of cancer. They are hard to find and difficult to destroy. By blocking signaling pathways that promote cancer growth and survival, cirmtuzumab may have complementary activity with ibrutinib in killing leukemia cells, allowing patients potentially to achieve complete remissions that permit patients to stop therapy altogether." Barbara Parker, MD, professor of medicine, breast oncologist and senior deputy director of cancer medicine at Moores Cancer Center at UC San Diego Health, said the goal in the new breast cancer trial is similar: to see if cirmtuzumab combined with paclitaxel can more fully and effectively eradicate tumors and cancer stem cells, reducing the possibility of recurrence. "Our primary objective, of course, is to determine whether the drug combination is safe and tolerable and to measure its anti-tumor activity," said Parker. "If it proves safe and shows effectiveness against breast cancer, we can progress to subsequent trials to determine how best to use the drug combination." Parker is co-principal investigator of the breast cancer trial with Rebecca Shatsky, MD, a medical oncologist and breast cancer specialist at Moores Cancer Center.